With his feet secured on a restraint on the space station's Canadarm2, NASA astronaut Mike Fossum holds the Robotics Refueling Mission payload, which was the focus of one of the primary chores accomplished on a six and a half hour spacewalk on July 12, 2011. NASA astronaut Ron Garan, also a station flight engineer, who shared the spacewalk with Fossum, is out of frame. A software glitch has stalled an International Space Station experiment to test the ability of robots to refuel and repair satellites in orbit, NASA officials announced Wednesday (Jan. 16). The issue arose during NASA's latest round of field tests for the Robotic Refueling Mission (RRM), which began Monday (Jan. 14) and was expected to last about 10 days. The demonstration calls for using the space station's Canadarm2 robotic arm and its attached Dextre robot to simulate refueling a satellite in space. 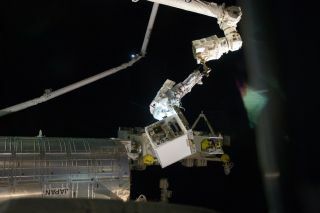 On Tuesday evening (Jan. 15), the Canadian Space Agency — which provided the space station's Dextre robot and the Canadarm2 — requested a temporary halt in RRM operations, according to a status update. "An intermittent difference in the software that controls Canadarm2, the International Space Station’s Canadian-built Remote Manipulator System, requires further analysis to ensure safe operations," NASA officials wrote in Wednesday's mission update. "Canadarm2 and the Special Purpose Dexterous Manipulator, or Dextre, has temporarily been placed in a safe configuration while engineering teams on the ground assess the data," they added. "CSA will provide a status shortly to determine when work can safely resume." The RRM experiment hardware was delivered to the space station in July 2011 by the shuttle Atlantis during the last-ever flight of NASA's storied space shuttle program. The experiment's goal is to demonstrate technologies that could fix and refuel orbiting satellites robotically, thereby extending spacecraft lifetimes and potentially saving satellite operators billions of dollars. Other applications may also develop from such capabilities, NASA officials have said. "The technologies we're building to help rescue satellites in five years could be the very same ones used to clean up space 10 years in the future or save a spacecraft on the way to Mars 30 years from now," Benjamin Reed, deputy project manager of NASA's Satellite Servicing Capabilities Office, which built RRM, said in a statement. "RRM is just the beginning." RRM is a washing-machine-size module affixed to the space station's exterior that contains activity boards and tools necessary to practice on-orbit refueling. The first RRM experiments took place last year, when controllers on the ground used Dextre to snip two razor-thin wires with just a few millimeters of clearance. The latest round of operations will ratchet up the difficulty level, with Dextre snipping more wires, unscrewing caps and pumping simulated fuel, NASA officials said.